Similar words (thesaurus) – get an automatically generated list of up to 40 most similar words. The thesaurus finds not only German synonyms, but generally, all words related to the same topic (view in deSkELL). All German examples, collocations and synonyms were identified automatically by ingenious algorithms and state-of-the-art software analysing large hundred-million samples of text. No manual work was involved. 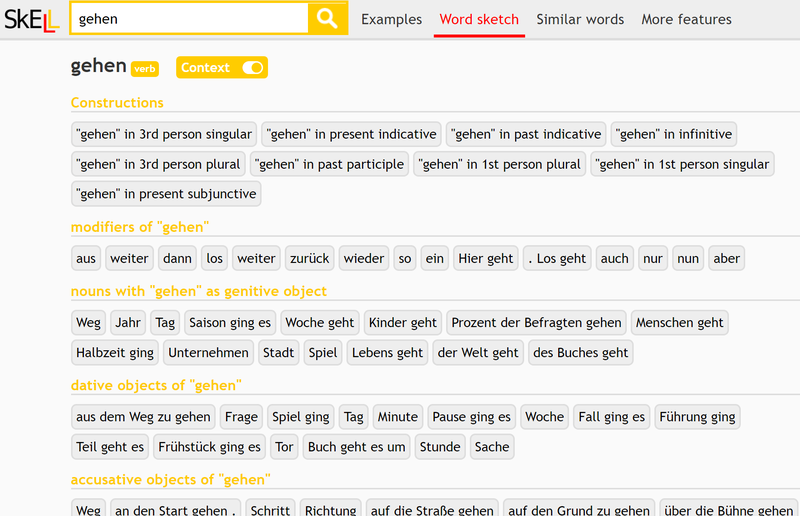 SkELL finds good examples of the German word or phrase useful for language learners. Google Search finds web pages with information about the topic specified by the word or phrase.